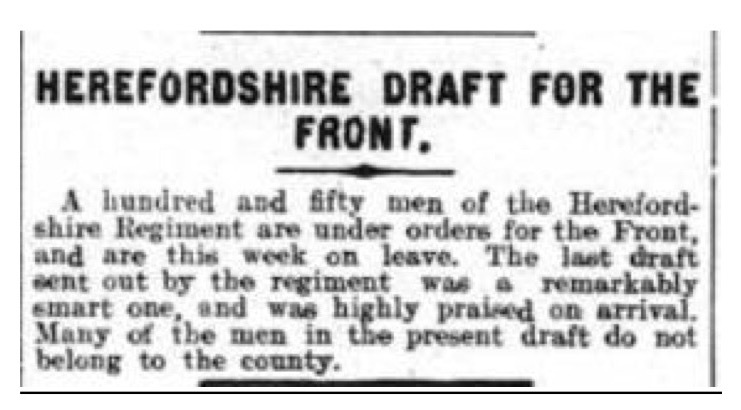 The Battalion was also warned to send another draft. In its 19 August edition the newspaper printed an account of the draft in France in a letter sent by a Herefords Saddler in the base Remount depot at Rouen. The writer was a native of Hereford and formerly a boy at the Bluecoat school but did not want his name to appear. The writer recorded how, on 12 July, the Battalion paraded at Bedford and ‘was asked for 150 volunteers for France. The order was for volunteers to take two paces forward. On the last sound of the word “march” the whole battalion moved like one man. This made it necessary for selection. There was bitter lamentation amongst the men who have to wait longer for the opportunity of doing their bit. The lucky ones were sent home on leave, but you will know all about that. On the 27th we left Bedford for Southampton, leaving the parade ground and marching to the station, headed by the bugle band and accompanied by the C.O. The adjutant wished us good luck and a safe return.